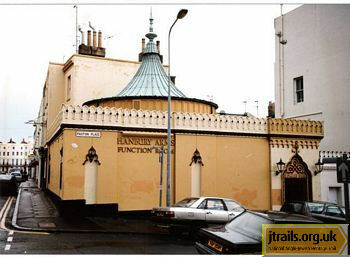 Sassoon Mausoleum -- Bombay Bar and Function Room, junction of St. George's Road and Paston Place, Kemp Town. One of the most unexpected of all Jewish monuments in this country is the Sassoon family mausoleum. What marks it out is its location on the street in a residential area -- it is not part of a cemetery or set away from habitation, it is in the center of its local scene in Kemp Town. Further its oriental Indian style gives it an altogether exotic air, more curry house than sepulchre. It was built by Sir Albert Sassoon in 1892 in a style evocative of the Royal Pavilion, while evoking the Bombay origins of the family. Both Sir Albert and his son Edward were buried there, but their rest was interrupted in 1933, when his grandson Sir Philip Sassoon sold it in 1933 and the remains of his family were transferred to London. In the Second World War it became an air-raid shelter. After the war it was bought by the adjacent Hanbury Arms in 1953. They turned it into a function room.